MONTREAL — Maybe it’s because Tom Hanks is such a superfan of the U.S. women’s national team, the kind who likes posting pictures of himself in a Heather O’Reilly jersey, but on Tuesday it was hard not to smile and imagine the character Hanks played in *A League of Their Own* announcing to everyone: There’s no crying in soccer! But there is, of course, and the tears and emotion and passion are what makes this sport—and let’s go ahead and say it, this U.S. team—so great. So yes, there was U.S. defender Julie Johnston crying on the field after enduring “a defender’s worst nightmare,” as she put it afterward: Committing a penalty that gave Germany the chance to take the lead from the spot in the 60th minute of the Women’s World Cup semifinals. The 23-year-old Johnston had been a revelation in Canada, the U.S.’s most consistent performer all tournament long until that moment when she took down Alexandra Popp in the box (and should have earned a red card instead of a yellow; more on that later). But then, one by one, Johnston’s teammates came over to rally behind her. None made more of an impression than her centerback partner, Becky Sauerbrunn. Soccer is a funny old game. Germany’s Celia Sasic, who had been cold-blooded on her penalty against France, sprayed her spot kick wide of the goal—U.S. keeper Hope Solo clearly iced her by taking plenty of time to get set—and suddenly instead of playing 10-on-11 and being down a goal, the U.S. was still all square. Only nine minutes later, Carli Lloyd, who plays like she’s carrying a New Jersey-sized chip on her shoulder, showed everyone how to take a penalty, burying her kick and giving the U.S. the lead for good. 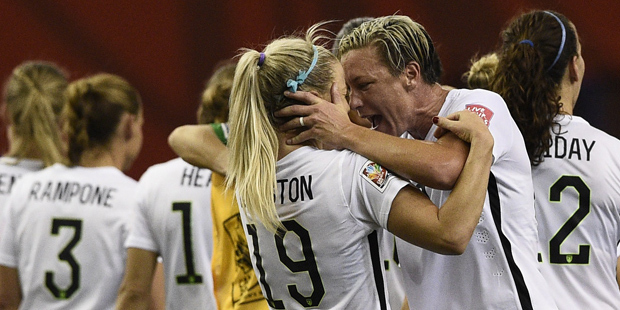 So yes, there’s crying in soccer, men’s and women’s both, and would we have it any other way? This is what happens when the stakes are as high as they get, when you have to wait four years for proving-ground nights like this one, when you have to rely on your teammates in the ultimate team sport. That’s what this U.S. team has going for it now as it heads to the World Cup final again after Tuesday’s 2-0 victory. How many other examples did we see of players supporting each other? If you were looking for a Best Supporting Actor in a Team Role, there were any number of candidates on Tuesday, from O’Hara, who came on late and scored the first goal of her national team career; to Lloyd, who buried the penalty, played four different positions and assisted on O’Hara’s goal; to Solo and the defense, whose shutout streak has now reached a remarkable 513 minutes. In the end, you also had to commend coach Jill Ellis, who made the gutsy call to start three central midfielders for the first time in this World Cup. With her tactical decisions, Ellis gave her team the chance to outplay Germany, the world’s No. 1-ranked team, for 90 minutes. Soccer is about emotion, and it’s about history and the feelings that history gives you. Maybe the soccer gods owed the U.S. a win against Germany after that night in 2002 when a Scottish referee named Hugh Dallas refused to call a penalty after Torsten Frings handled a ball on the German goal line in the World Cup quarterfinals. And maybe there was a bit of payback on Tuesday, as Romanian referee Teodora Albon gave the U.S. a boost against Germany by not issuing Johnston the red card she deserved, then calling a penalty kick for the U.S. even though Morgan appeared to be hit just outside the penalty box. There were tears on the field in Ulsan, South Korea, on that famous night 13 years ago. And there were tears on this field on another famous night in 2015. There is crying in soccer, everyone. And at this rate you might see it again in Vancouver on Sunday, in the World Cup final.